GoodChill Awards Thrive CryoStudio, with "Best Chill Spot Award" for Best Cryotherapy Location in the U.S.A. Thrive CryoStudio, of Rockville, Maryland, receives great reviews from satisfied cryotherapy users on GoodChill and across the Internet. Rockville, Maryland, October 6, 2016	(Newswire.com) - ​​​​​​​For people seeking optimal healing benefits for their sports injuries, recovery needs and other inflammatory issues, whole body cryotherapy has grown to become a very popular therapy for people looking for alternative pain relief. Whole Body Cryotherapy is an innovative, holistic wellness therapy that enables the human body to recover and rejuvenate itself naturally. During cryotherapy, the individual enters the cryosauna where the body is exposed to extremely cold temperatures (between -220ºF and -270ºF). This process "tricks" the body into going in a hypothermic process, which causes vasoconstriction of the veins to draw the blood to the core in order to protect the vital organs from the "freezing" temperatures. After the 3-minute therapy, new blood filled with increased oxygen, nutrient and enzyme levels, flow back throughout the body delivering re-oxygenated blood which then initiates a healing process to areas that need it. Because the nitrogen vapor only penetrates 1/8 of an inch below the skins surface, an individual warms up almost immediately after the treatment, unlike an ice bath, which usually takes hours to warm-up and recover from. However, as the therapy continues to become more mainstream, and more cryotherapy locations open across the country, business owners have to stay creative and provide more than just extreme cold therapy to excite interested consumers to visit their location. The GoodChill program is the first of its kind, that was developed to help cryotherapy businesses have a platform specific to cryotherapy that can increase consumer awareness of the therapy and gain their feedback just like Yelp, Open Table, Trip Advisor, and so many other online applications that have consumer feedback capabilities. In addition, consumers can utilize the e-commerce aspect of the website, to buy cryotherapy merchandise and book sessions directly from the website. By creating a program that will allow consumers to give their feedback on a public forum, cryotherapy locations can now showcase their competitive edge to consumers looking to make a choice in the cryo spa that fits their needs. 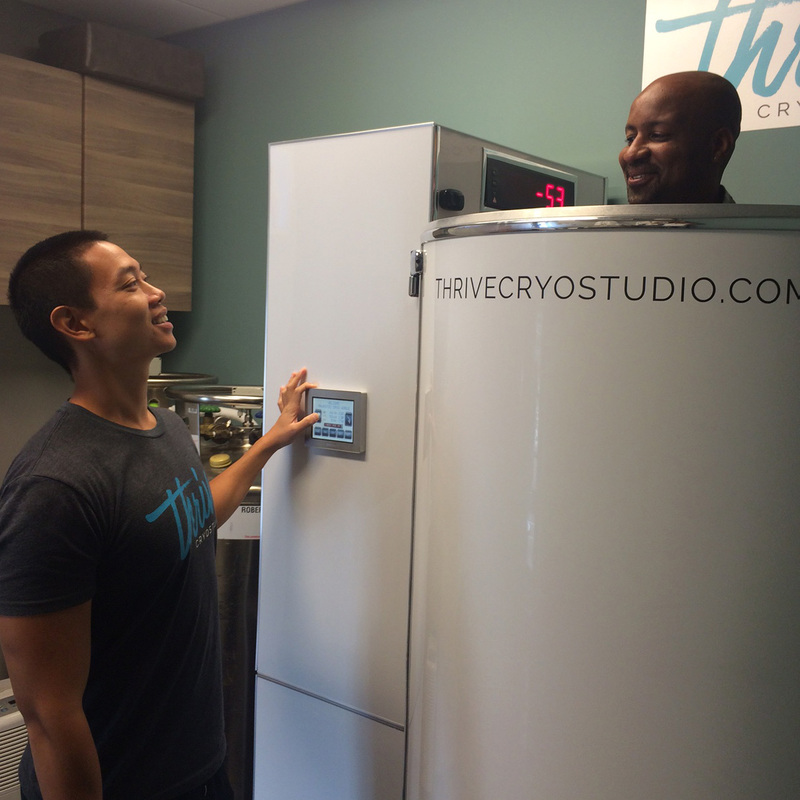 “We're honored to have been chosen to be the first ever "Best Chill Spot" location of the month,” exclaimed Brandon Yu, owner of Thrive CryoStudio. "Our top priority is the safety and top-tier customer service that we provide to our customers. Receiving this award just confirms that we've been hitting the mark in both those areas." Make sure you visit their location and see just why we voted Thrive CryoStudio as the first ever, GoodChill Club Award Winner: http://www.thrivecryostudio.com/. Thrive CryoStudio is a very unique cryotherapy location. Instead of establishing a stand-alone brick and mortar location, they partnered with Symmetry Salon Studios, establishing the first ever whole body cryotherapy spa alongside its community of salon businesses. The partnership is a win-win relationship that can now offer cryotherapy and other recovery modalities, to its existing salon-based customer traffic. Thriving! That’s what Thrive CryoStudio is doing. Having just opened in the summer of 2016, they are already looking to expand within the next two months, into other locations within the Maryland and Washington D.C. areas. In addition, they will be adding additional services, including compression and infrared to its selection of therapies. “We are very happy with the unique service that Thrive has offered. I feel great and have been waiting for a cryotherapy location in the Maryland area. Brandon and his team provide a very relaxed and fun atmosphere, conveniently located so that I can do other things inside the Symmetry Salon Studios during my visit,” said M. Cunnigham (Thrive CryoStudio Customer). Whole body cryotherapy will continue to grow with providers like Thrive CryoStudio at the helm, setting a standard for other locations to follow. In addition, with online programs like Good Chill, consumers looking to find the best cryotherapy location in their area, will now have a resource to go to that will provide real-time reviews and other valuable information, to make sure they can make the best decision when selecting their cryotherapy destination. ​Launched in September of 2015, GoodChill is the official website that features cryotherapy locations across the world, providing consumers with reviews and ratings of each location along with the ability to book and purchase cryotherapy sessions at local cryotherapy spas, purchase merchandise, and a social media feature for cryo-enthusiasts to share their experiences with other members. GoodChill will offer all types of "Chill Spots" from massage parlors to float spas. Visit their website at http://www.goodchillclub.com. We are leaders in the whole body cryotherapy industry paving the way for a new industry committed to success. CryoNext, LLC of Orlando, Florida leads the way, delivering valuable, revenue-generating modalities to its portfolio of wellness products with its focus on whole body cryotherapy. Athletes across the world will now have a place to get their "Chill On" at any city they travel to, with the highly popular and beneficial performance and recovery treatment - Whole Body Cryotherapy.